Set up the connection between a Dynamics 365 for Customer Engagement instance and Social Engagement so you can link social posts to Customer Engagement apps. Linking posts lets you create Customer Engagement records from social posts that were found in Social Engagement by using the Automatic Record Creation and Update Rules feature. The following prerequisites apply to both Dynamics 365 for Customer Engagement and Dynamics 365 (on-premises). Prerequisites specific to Dynamics 365 for Customer Engagement or Microsoft Dynamics 365 are listed later in this topic. You have a license assigned for both Dynamics 365 for Customer Engagement and Microsoft Social Engagement. You have a System Administrator security role in your Dynamics 365 for Customer Engagement instance. Contact your system administrator if you need an upgrade to your licensed products or an update to your permissions. You have an Administrator user role in Social Engagement. To find out your user role in Social Engagement, go to Settings > Personal Settings > Your Preferences. Your browser is likely to block any pop-up windows opened by Social Engagement when authenticating to Customer Engagement, Twitter, or Facebook. Learn more about the recommended browser settings to manage authentication pop-up windows. Your Dynamics 365 for Customer Engagement instance is upgraded to Dynamics CRM Online 2015 Update 1 or a later release. You have upgraded to at least Microsoft Dynamics 365 (on-premises) and the deployment is IFD-enabled. Your Customer Engagement (on-premises) instance is an Internet-facing deployment (IFD) with a public IP address. Enable OAuth support by following the post-installation and configuration guidelines. Add-AdfsClient -Name MSE -ClientId e8ab36af-d4be-4833-a38b-4d6cf1cfd525 -RedirectUri @("https://app.mi.ai.dynamics.com/api/connect/version/1.0/solutions/<solutionid>/crm/oauthRedirect","https://listening-prod.dynamics.com/api/connect/version/1.0/solutions/<solutionid>/crm/oauthRedirect") -Description "OAuth 2.0 client for MSE"
The Link to Dynamics 365 feature doesn't support Microsoft Dynamics 365 (on-premises) apps in combination with the Internet Explorer or Microsoft Edge browsers. To connect the services, both both of them must be part of the same organization's Office 365 subscription. In Social Engagement, go to Settings > Connections > Microsoft Dynamics 365 for Customer Engagement. Select the Connection type from the drop-down list. Provide the connection information for your Customer Engagement instance. Select Dynamics 365 (online) and then click Check Instances to automatically discover all available Customer Engagement instances in your Office 365 tenant. Select the Customer Engagement instance you want to connect to from the list of discovered Customer Engagement instances for the selected location. For more information about the discovery process, see Discover the URL for your organization using the Web API. Based on the selected Customer Engagement instance, the value in the Name field changes. You can update the Customer Engagement name if required. 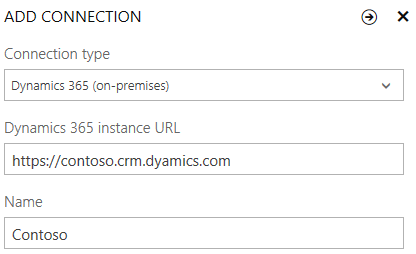 Select Dynamics 365 (On-Premises) and add the details of your Customer Engagement instance and enter a unique name for the connection. 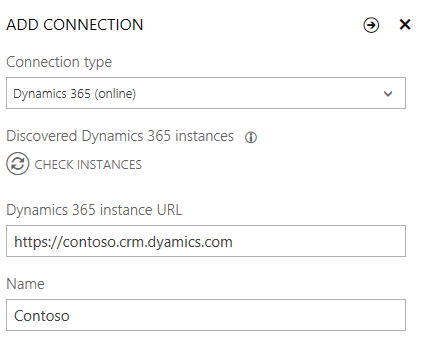 If the connection was successful, the Dynamics 365 Instance pane opens and shows you the details about the connected instance. You can set the Set as default control to ON to have this instance selected by default when creating new links to Customer Engagement records from social posts. If you changed a value in the Dynamics 365 for Customer Engagement Instance pane, click Save to apply your changes. The connected Customer Engagement instance is now listed in the main pane when you go to Settings > Connections > Microsoft Dynamics 365. Now that you've connected Dynamics 365 for Customer Engagement and Social Engagement, you can define entity details in Social Engagement to specify information for the Social Activity entity that is created when you link a post to Customer Engagement. When you are satisfied with the configuration of the entities, configure the Record Creation Rules in Dynamics 365 for Customer Engagement settings to automatically create Customer Engagement records from Social Activity entities.